Honor Oak woodlands under threat from council bulldozers! Plans to chop down hundreds of trees in two local cemeteries which form part of the Green Chain Walk close to Honor Oak and Forest Hill have provoked outrage in the community. But despite massive opposition and the signatures of more than 8,500 local residents, Labour-run Southwark Council are insisting that the plans must go ahead. The two affected sites are on the boundary between Southwark and Lewisham boroughs at Camberwell Old Cemetery next to Wood Vale and Camberwell New Cemetery on One Tree Hill. The Council’s plans include the felling of over 30 mature trees and the destruction of a protected grade 1 site of borough importance for nature conservation to make way for a modern sterile cemetery. The annual Summer Picnic will be held on Sunday, 5thJuly in the Triangle between Liphook Crescent and Horniman Drive from 1pm. Bring some food to share with friends and neighbours, plus your own plates, glasses, and cutlery. The Association will, as always, provide the liquid refreshments! Homelessness in Lewisham – a hostel solution? As part of the Council’s strategy to reduce homelessness in the Borough, planning applications have been submitted to turn 118 Canonbie Road and Hamilton Lodge on Honor Oak Road into hostels for homeless families. Short term family accommodation is much needed for Lewisham families who find themselves homeless, often through no fault of their own. At present there are 574 Lewisham residents being put up and paid for in bed and breakfast accommodation, many of them outside the Borough: this type of temporary accommodation is very expensive as well as being unsuitable for families in housing need. 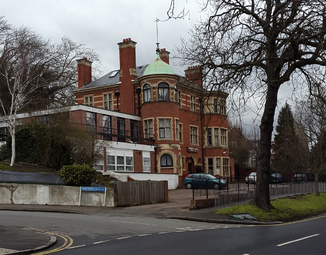 Hamilton Lodge, a detached three storey Edwardian building, was used as a 32 unit nursing home until it was purchased by Lewisham Council following closure after the Care Quality Commission found serious issues of non-compliance with four of five key regulations. The Council acquired 118 Canonbie Road in April after protracted legal processes to gain possession of the property which was being illegally run as a hostel. If change of use is approved, work will start to build self-contained accommodation for 9 families in Canonbie Road, and convert Hamilton Lodge into 22 residential units, some self-contained, some shared facilities, but all of a good standard. Neither properties will be used to house single homeless people. Objections to the planning applications have been raised by some TLERA members primarily concerning pressure on local services, particularly schools, and the potential for anti-social behaviour. Regarding primary school places, because of the temporary nature of the accommodation, in-year transfers will not be an issue if the children are already in another school in Lewisham. Children starting school for the first time this year will not be a problem either, as they will already have a school place. Looking forward to September 2016, the aim would be to find first time places in schools near to where the families are likely to be rehoused. Discussions with two of the three local primary schools indicate that they do not consider the proposals will present a problem for them. What is perhaps more of a problem for neighbouring householders is the antisocial behaviour issue. Members living near 118 Canonbie have had to endure years of antisocial behaviour when the property was used by a private landlord as an unlicensed hostel for mainly single people, many of whom appeared to have come to England in search of work. Police were frequently called to the property to deal with disturbances and instances of alcohol and drug abuse, often in the early hours of the morning. Council officers liaised with police, housing and environmental agencies to try to resolve the issues but eventually had no option but to undertake lengthy legal procedures to obtain vacant possession of the property in April. However, the effect on neighbours, particularly those with young children, has meant that there is an understandable mistrust of the property once again being used as a hostel, albeit a Council run facility. We have been assured that the Council has a long and successful history of managing hostels in the Borough and will provide a full management, housing support, maintenance and caretaking service. Householders will rent their accommodation by way of a licence which means that if they fail to comply with the conditions attached, e.g., not causing a nuisance or not looking after their accommodation, they can be served with a notice to vacate within 7 days, or sooner if necessary. The TLERA Committee have discussed the Council’s plans in detail on several occasions, but no clear consensus was reached. What was also clear in discussions with members was that there was also no real consensus among them. Given this, it was agreed that the Association should not formerly object to the proposals, but note any concerns that were raised and seek clarification/reassurance from the relevant Council officers. This was also the stance adopted by the Forest Hill Society (FHS). Rowena Lowe, our lead Planning Officer, is advising members who oppose the application of several issues she has identified that can be used in their letters of objection. These points have been shared with the FHS who have also raised concerns relating primarily to transport issues and the proposed internal layout of the accommodation. Soon after this post, the Council arranged a community meeting to give residents an opportunity to raise their concerns about the proposed change of use with our councilors and relevant Council officers. The second of our two garden openings for theNational Garden Scheme (NGS) will be on Saturday, 20th June between 5-8pm and Sunday, 21st June between 2-6pm. As in 2013, seven members are opening their gardens this year – too many gardens to visit in one afternoon, even for dedicated gardening enthusiasts! Coach House, 3 The Hermitage, Westwood Park (recently redesigned). Combined admission is £7, payable at 28 Horniman Drive (no charge for accompanied children). There are plants for sale at 27 Horniman Drive, and garden ceramics and sculptures at the Coach House. On Sunday tea and homemade cakes are available at 53 Ringmore Rise. There will also be a Story Trail for children at 27 Horniman Drive on both days. Members of the Garden Group have been opening their gardens since 2001 for the NGS. Last year was the best ever – just over £4000 was raised for cancer and caring charities. So do come along and help us to do even better this year. Sun comes out for Easter Egg Hunt on the Hill! After a week of overcast skies and high winds, we couldn’t believe our luck with the weather on Easter Sunday afternoon for the Easter Egg Hunt. TLERA had decided that it would be good to hold a family event early in the year to complement the summer picnic and the autumn fireworks and it was decided to hold this Easter event in aid of Demelza Hospice Care for Children. Demelza supports families with very sick children throughout south east London and Kent. 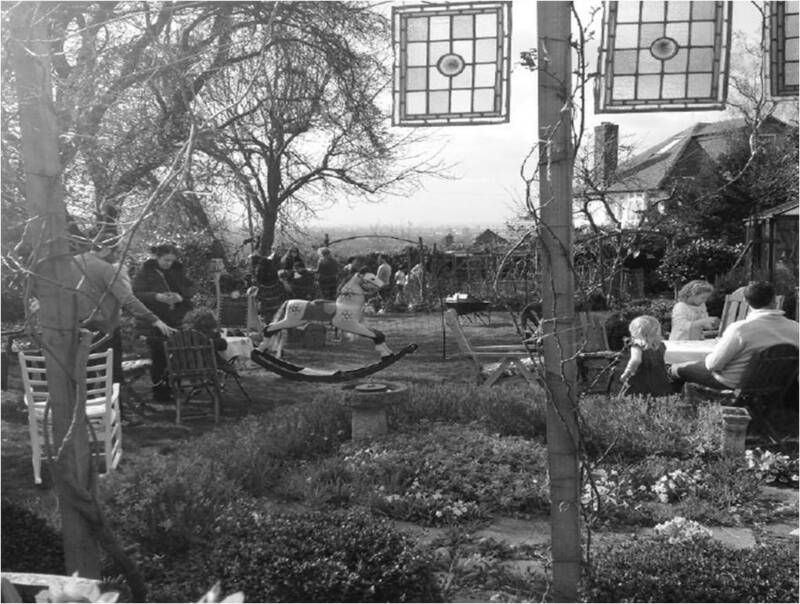 Originally, the plan was to use the Triangle, but we decided that the garden of ‘Hilltop’, Horniman Drive, would be a much better venue. All the TLERA wonderful cake-baking regulars sprang into action, and the Committee donated the chocolate eggs. Although many people were away for the long weekend there were still plenty who came along with their Easter visitors. The children loved hunting for eggs, feeding the chickens, riding the rocking horse, and following the ‘Hilltop’ Story Trail. The atmosphere was great and it was particularly nice to meet new families on the Hill. Demelza has written thanking us for the cheque for £360.72 raised from the small entrance fee, selling refreshments, and the generous donations we received. Many people who came said they were in favour of supporting future events held for Demelza. On this note, I would like to hold other such events in the garden, so if anyone has any ideas for fundraising events please come and talk about them! The Story Trail is always there (and developing all the time) so all we need is the weather and the cakes! All in all, the afternoon made me – as always – extremely grateful that I live on this lovely hill, with TLERA and all the people who put so much time and energy into events like this one. Reservoir site under threat – again! Last November, TLERA members living in and around the reservoir site received flyers from Thomas Wrenn Homes Ltd inviting them to attend an ‘illustrative’ display of a proposal to not only build houses on the site but also on 116-118 Canonbie Road. 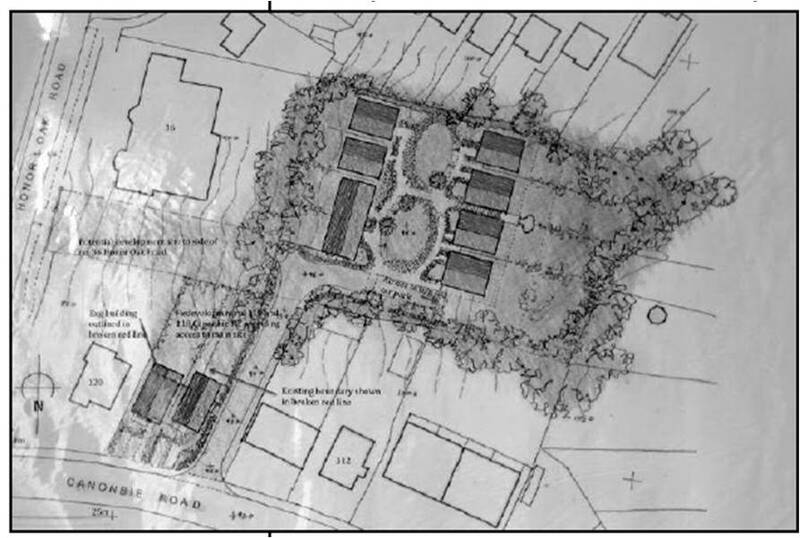 An attempt to once again develop the reservoir site and what was formerly 116 Canonbie Road was not entirely unexpected given they are both owned by Mr Wrenn. However, the inclusion of 118 Canonbie Road in the scheme was very surprising – as you will have read, Lewisham had recently acquired the property and were working hard to gain vacant possession. The Association arranged for Committee members to go along at various times during the day to view the proposed development and gauge the opinion of TLERA members who attended. Needless to say, there was no support for the development, with many expressing real concerns about its impact on both neighbouring houses and the environment – the developer’s assurances that the ecological value of the site was appreciated and would be conserved were not convincing. 20mph – The good, the bad and the ugly! THE GOOD: After much pressure from campaigners, Lewisham Council has finally agreed to introduce 20mph zones throughout the borough. Hoorah! This is fantastic news and will hopefully go some way in helping to make our streets safer. Surrounding Southwark streets are all now 20mph so it only makes sense to unify the area. THE BAD: This is, however, just one step in a long list of safety measures we are urging the Council to implement in order to make the local streets safer. Despite engineers visiting the site last summer, being shocked at the potential traffic dangers and making promises for immediate action, still nothing has been done. THE UGLY: Rat-running and reckless driving on Canonbie Road and Westwood Park are reaching alarming proportions: on Monday 9th February, 240 vehicles were recorded between 7.30am and 8.30am. This is a highly dangerous volume of traffic for what should be quiet residential streets. Smart Sat Navs (designed to find shortcuts) are the biggest part of the problem, leading vehicles along Canonbie Road away from the South Circular and nearby junctions. Roads on the Estate are now considerably more dangerous than they have ever been due to this increased volume of traffic. Many heavy commercial vehicles ‘shudder’ up and down the roads every day, causing vibrations that have been shown to damage foundations and structures of adjacent properties. We need to act now before the situation gets out of hand and what is now a temporary solution becomes a permanent one. We are continuing with our campaign to urge the Council to do something about this before there is a tragic accident. Please help us to stop this madness!